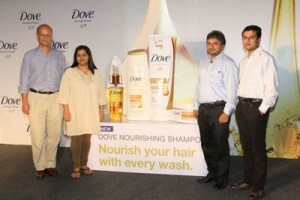 With the launch of the new Dove Nourishing Oil Care Range, Dove and IndiBlogger decided to present the “Love your Hair and it loves you back” blogger contest. Wow! What amazing attractive prizes to win! With the announcement of the contest I started thinking about my hair and it reminded me the story of the prodigal son. My hair was there on my head, thick and strong, always, since the time I can remember. I never bothered to care or nourish it ever. The time my Mom spent removing the knots, oiling it and combing it neatly was spent by me reading a book. My only contribution for the whole process was the whimper I would let out when I felt a tug on my hair............ before continuing with my book. My mom took good care of our hair by oiling it with pure coconut oil and washing it cleanly with warm water. She did not trust us with our hair care until we were quite grown up. For me, the hair was of not much importance at all. I never suffered from hair fall or dandruff, so I think that means my Mom loved the hair it loved me back making it kind of three street affair. I had no time to love it. I was always busy with books, games or being naughty. The two plaits hanging on my shoulders never got any love or attention from me. My hair has very much similarity to the parable of “The Prodigal Son”. I studied in a convent. Some of the lovely memories of those times are the moral stories we would come across during our moral science period. I could never empathize with one of the characters back then. 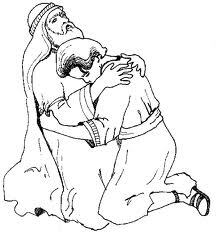 It was the father in the parable of ‘The Prodigal Son’. I sympathized with the elder brother who had served his father so well, but sadly his goodness was never observed, which is well expressed in his own words, "Behold, these many years I have served you, and I never disobeyed a commandment of yours, but you never gave me a goat that I might celebrate with my friends. But when this, your son, came, who has devoured your living with prostitutes; you killed the fattened calf for him." When the father explained to him how the joys of having found someone you have lost calls for celebration, I felt anger surging in my heart. I loved narrating stories and parables to my son, but, this one was always left out; as I felt what the father had done, was absolutely wrong. He should appreciate his good son more and express his appreciation to him. I cannot say I have totally changed my mind now,but somehow I can understand the joy the father felt when the son returned to him. The change came with the treatment for breast cancer which involved chemotherapy. I did not pay much attention to the part of hair loss which would accompany the treatment, because my concern at that moment - for the surgery, my physical changes, death, and above all my children,, had pushed the impending hair loss to the back of my mind. 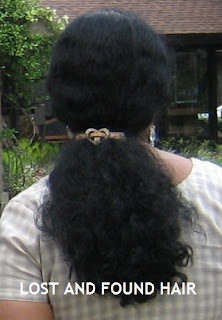 It was only after the second cycle of chemotherapy, when one fine day my hair decided to give me a scare by coming out in bunches as I tried combing my it, did I realize that I would go bald for at least few months and had to deal with it. By the time I finished brushing my hair, my lap was filled with enough strands to make a wig. Filled sadness and bitterness, I was totally confused and I did not know what to do with it. I calmly dug a hole and buried the hair. My sense of humour was missing that day. I did not have enough information or coolness to donate it to making a wig which my daughter did after 12 years. I had half hair still left on my head but I knew that in no time they are going to come out and soon I will have to deal with total hair loss bravely. 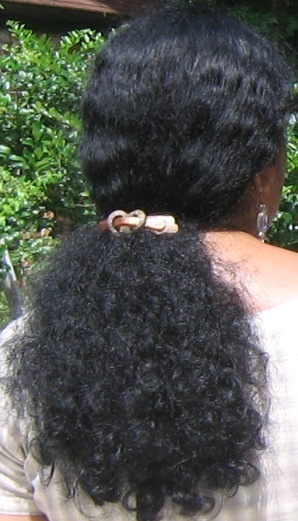 I could have shaved all of it and spared the trouble of having them fall down all over me, but back then, not being familiar with chemotherapy, side effects and a young foolish woman, I lovingly held on to the whatever strands were left on my head until one fine day they said goodbye to my scalp and left it bare. It scared my kids to see their Maa with bald head. More than fear it was the concerned and worried looks they gave me which wrung my heart. If I were smart I could have shaved off their tiny heads with mine and had fun with a good bold and bald family, unfortunately I was not cancer smart back then. Days went by and I slowly got adapted to the bald head. I used to feel kind of cold and light headed earlier but slowly it started to feel normal to be bald. People would give me stares and ask questions at times. Someone offered me flowers to wear on my head as a joke. Some predicted that my hair would never grow back. Someone used my head as a band to beat on it rhythmically. I hurt inside but did not show it outwards. It was no time for fun for me. I was fighting a rough battle for my life and all these people could see was the joke on my bald head. Aaahhh! How boring life would be without such people around us (Sarcasm). Unknowingly I developed a habit of running my hand over my bald head and loved the smooth feeling of it LOL. One fine day I felt something rough on my head as though it was having a bad rash, which worried me. But to my pleasant surprise I saw there was some hair sprouting on my head. This is something I would say the ‘WOW’ hair moment of my life. My hair turned up more curly and short after my Chemotherapy. It was not the same type of hair I had earlier. I love my new hair. Although I have learnt my lesson and realized that I am same person even with the bald head…….. not everyone is smart enough to know it. So my hair deserves love, care and pampering. I am quite excited with the launch of Dove’s products of New Dove Nourishing Oil Care, because, I can now treat my prodigal hair with the love and care it deserves. There is no need for my Hair to feel rough and dry after a hair wash, because ordinary shampoos will not be allowed to strip my hair of its natural oils hereafter. 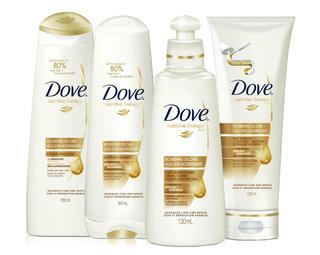 New Dove Nourishing Oil Care Shampoo which is enhanced with Vita-Oils will go deep inside my hair fiber and help lock in the nourishment of oil; making my prodigal hair smooth, shiny and beautiful with every wash.
On the tough hair days or when I am exposed to sunrays or wind, the Dove Nourishing Oil Care Shampoo with Fiber Actives and Vita-Oils give Vitamin enriched nourishment will make my hair resilient to damage. I will not have to fear rough hair anymore because dove has taken care to fight Dryness is the very first sign of damage, which makes my hair, look dull and feel rough. I am going treat my hair with Dove Nourishing Oil Care Daily Treatment Conditioner that has the power of double nourishment which will restore my hair's smoothness and softness. My hair has got used to oiling because my mom used to oil it regularly. I am used to leaving the oil in my hair overnight which doesn’t bother me at all. I am very excited to try the Dove Nourishing Oil Care Vita Oil Serum which has Vita- Oils to replenish my hair with essential oils. Dove also has Nourishing Oil Care Repair Mask to nourish the hair from deep inside and effectively repair the damaged hair. I think it is time for celebration all over again and have the ‘Wow’ hair moment once again in my life with Dove Nourishing Oil Care Range of products. Love is a two way street: Love your hair and it loves you back! Hi Farida.. I've always loved pure coconut oil - very nourishing and a great sculpting creme for my teen boy. Nice to see you on Facebook. You have BEAUTIFUL hair :) Big hug! Envy ppl who have good hair..nice poem :)) all the best !! love pure coconut oil products for my hair...what is better than this? Thank Vidya, Betty and subtlescribbler for your comments on my hair... actually it is kind of coir but I have started loving it now. Yeah even I used to hate my curly hair but your post has put things in perspective. So inspiring. Visiting from the group Blogger by Passion. I've always known about the benefits of pure coconut oil...it's something that has many uses, especially good moisturizer for dry skin. I hope you are doing much better after what you have been through. You are very brave to tell us your story. Even though your hair looks good now, with or without hair you are still beautiful. Be well & thanks for sharing. Thank you very much for the comment .. I am doing much better now. I have been lucky to steal 15 years of survival from cancer. Loved ur blog post - u r a survivor & that speaks a lot about u ! Very nice post! Loved the poem. Hope you are doing well now. this is my post link- http://www.indiblogger.in/indipost.php?post=87759 please click the link and view my post to promote it and return back to the link and click on promote the post.. I am so grateful for all of your good wishes. I Thank God for keeping me safe for 15 years now. A touching poem, thanks for sharing it. Loved your poem and the way you approached the theme. the entire stuff just flowed from my heart. very sensitive and exquisitely penned. The worth and neglect very well stated. felt the pangs. Aww Bindu- Thanks for the compliments. You have written amazing poem and deserve the best. Down memory lane and a new chapter in life - real life story and dove an inspiration -lovely poem - good wishes from a fellow contestant! I could feel your moments because I had seen the same for my father too.. Chemo is process of curing the patient by killing them to give a new life. Yeah coconut oil is the best and I remember the time my Mom used to oil my hair but now in this fast forward city I use only creams.. Hmm sad.. what to do..
and I am sure Dove will nourish many lives for sure.. All the best.. Thank you so much Specs Buffy and SIS. What an amazing journey, indeed a hair raising story..hats off to you for courage. Heart touching post ! It was kind of hair raising (pun intended) episode of my life. You are very brave and inspiring person. Not many people around you know what you have been through. God bless! It is tough to deal with cancer but then there are people who are tougher than the disease itself.. WOW! Yes Alice. Like the quotes says, tough times do not last but tough people do! yes farida!! Indeed a great product. market along with the approval rate is very high. with the approval rate is very high.